Adrian Buckley, Founder and Director of the award-winning costume jewellery company Buckley London, has donated a further supply of his Yorkshire Rose pins to help the residents and businesses following the Tadcaster floods. Gillian Hainsworth, a teacher of Music at Tadcaster Grammar School, was put in touch with Buckley London via the Duke of York’s Private Secretary at the time of the Tadcaster floods. 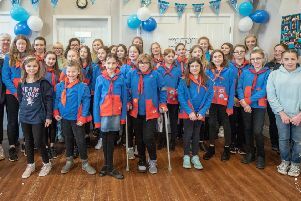 They very generously donated 2,000 Limited Edition Yorkshire Rose pins; all proceeds from the sale of the pins going directly to the Tadcaster Flood Support and Fundraising group, of which she was invited to become a member. The Tadcaster Flood Support and Fundraising Group has provided much needed financial support to local residents and businesses which were affected by the Boxing Day floods. The initial 2,000 pins sold very quickly and raised the phenomenal amount of £8,604.00. Mr Buckley, visited Mrs Hainsworth in Tadcaster in July and he was very impressed with the amount of money raised for the Tadcaster residents and how quickly the pins had sold. He realised the enormous effect the pins had had on the community of Tadcaster and promised without hesitation to give a further donation. Last week Mr Buckley once again visited Tadcaster and handed over a further 1,000 to Mrs Hainsworth to raise yet further funds for those residents and businesses affected by the floods in Tadcaster. “I am overwhelmed by the generosity and compassion shown by Adrian towards the Tadcaster community. “He is a truly wonderful human being and I am immensely grateful for his kindness in giving me this opportunity to further help the residents and businesses of Tadcaster,” said Mrs Hainsworth. The striking Yorkshire Rose pins have now been distributed in Tadcaster and neighbouring villages and are selling for a minimum donation of £4.